The GAS-300 is a solidly constructed student to intermediate instrument intended to give the learning musician an affordable instrument to develop his or her skills on. It is built with quality materials and craftsmanship that ensure it will withstand the rigorous student treatment an introductory instrument can sometimes undergo. 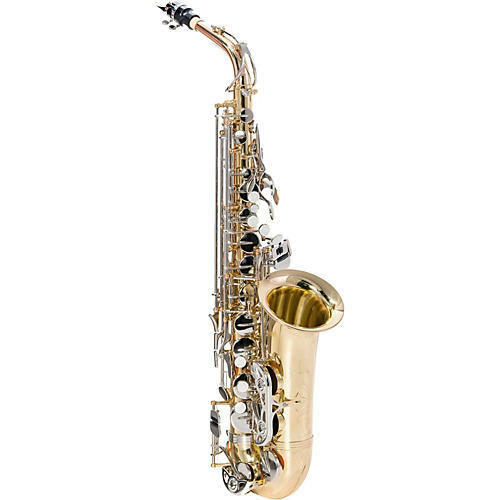 In addition to a gold lacquered yellow brass body and bell, it features a nickel-plated neck, high F# key, teardrop front F# and G Articulation Arm. It has Pisoni pads, metal tone boosters, post to body construction, and is characterized by a warm and pleasing tone. A molded ABS case and five-year warranty round out this outstanding instrumental package.